Yesterday was our first official day at the Sea Otter Classic. As I said in my previous blog we got here at 10am and quickly set up our tent at our campsite. At first I was a little disgruntled at the high winds at the event as it made it very cold outside. Then I found out we had to walk kind of far to get to the expo and the media center. However, my discontentment turned to joy after we picked up our packet for the recreational bike tour (more on that later). After getting our bib numbers for Saturday’s ride we were given a free goody bag. I’m still not exactly sure what’s in it but who cares, it’s free! My joy was taken to a whole new level when we walked up to the media center. I LOVE the media center. As I mentioned in my last blog we were privileged enough to work with Amateur Endurance for this event which helped us get media passes. Media passes are awesome! Once in the media center you are allowed free WiFi, free sandwiches and drinks, another goody bag, free parking close to the race track and free red vines. Is there anything better than free red vines? I want to live here. Anyway, of course the best thing about media passes are the access you get to the races. 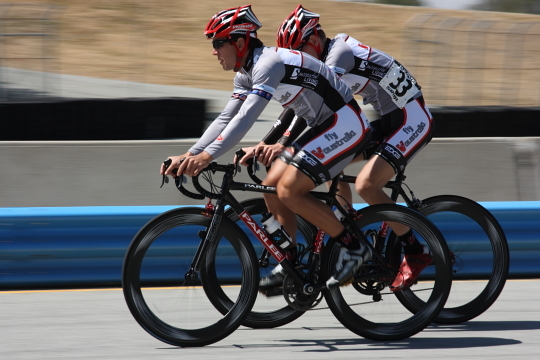 Bryan and I got to photograph right on the race track. This is huge deal for us since Laguna Seca is a historic raceway. Bryan was especially excited because he has raced on Laguna Seca before in numerous video games and has finally got to see it in real life. The first thing we did after visiting the media center was go down to the expo. 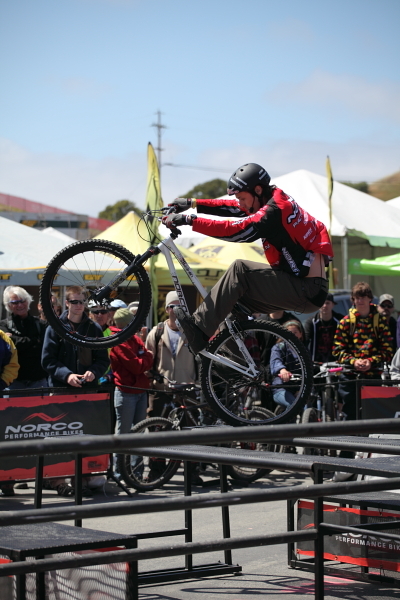 There are hundreds of vendors at Sea Otter and we got to see a lot of what they had to offer before the crowds arrived for the weekend. 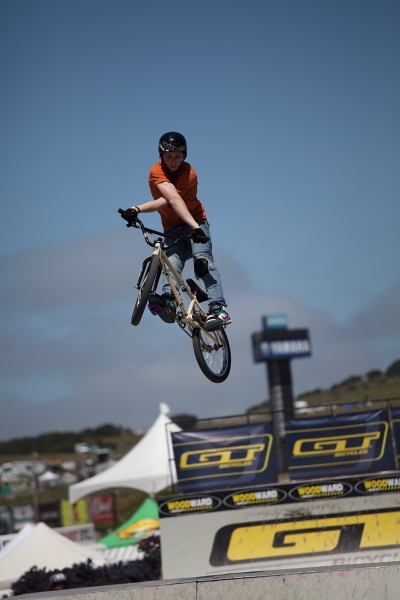 We also saw some big air stunts by the GT Bicycles team. 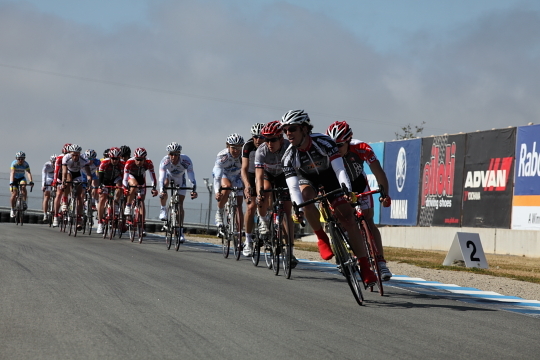 We decided to go check out the Men’s Criterium Category 1/2 which is a road race on the track. We actually got to walk down to the garage area where the pits are. We were in awe at the whole thing. 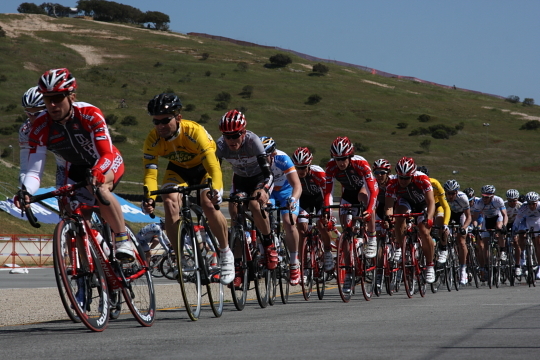 While Bryan used our telephoto lens to capture the cyclists as they came out of the final corner I walked to the hairpin turn just before that. I actually got to walk on the track, I don’t know why that makes me feel cool but it does. We ended up getting some awesome shots which we have posted below. Of course we were totally exhausted after everything. I was excited to get back to my tent for a good night’s sleep. I probably got a total of 3 hours between the hours of 8pm and 6am but it’s okay because I’m ready for another jam packed, exciting day at Sea Otter. Check out Bryan’s event coverage at Amateur Endurance. You can also see photos from Day 1 in the GALLERY.